If you choose this option, position the projector carefully to ensure that it won’t be run over by the car as it pulls out of the driveway. Tape down cords that stretch across walkways to prevent them from becoming a tripping hazard. Make your garage door look like one giant present! This is an inexpensive and attractive option if you can find waterproof gift wrap. Especially here in the Chicago area, any decorations you install must be impervious to melting snow, sleet, rain and ice. When attaching gift wrap, attach it to the door section by section, so that each section of the door remains unattached to the other sections. If you cover the joints between sections, the wrapping will likely tear when the door opens, which could cause the door to malfunction. Many companies now make murals that attach safely to garage doors. Often, these murals attach easily to the front of the garage with hook and loop fasteners, so they can be removed easily at any time. Many holiday murals are designed to look like three-dimensional illusions. Some murals give the appearance that the garage is an entryway into another realm, others have traditional holiday messages or show traditional holiday scenes. If you decide to cover your garage in a mural, attach the mural to the garage following the manufacturer’s instructions. Once the mural is on the garage, slice the mural on the joints between sections so that the garage door can bend at the joints when it opens and closes. A traditional way to decorate your garage without buying a lot of garage door-specific equipment is to simply line the entryway with lights wrapped around artificial garlands. This illuminates the perimeter of the garage door without interfering with the opening and closing of the door. Many homeowners do this by inserting hooks or nails into their garage door frame. If you choose to do it this way, keep the hooks contained to the inside of the frame where the wood is sheltered from rain and snow. This prevents water intrusion that can eventually rot the wood. Many companies that make garage door murals also create garage door magnets and decals. These accessories are designed to be installed on garage doors without the fuss or hassle. When trying to decide whether or not to use a magnet or a sticker decal, check to be sure that your garage door is made of magnetic material. If the door isn’t magnetic, then you’ll be limited to using decals. If magnets will stick, you can have your pick of any product in whatever design you prefer. If none of the above ideas sound good to you, then it may be that a DIY decoration is the best option. Use art and craft materials from home to create a holiday scene or a painting either in front of or attached to your garage door. Decorations attached to the surface of the door must lay flat against so that they won’t scrape the frame or mechanical parts when the door is operational. Do not attach electrical wires to any moving part, including the door itself, as this could become a hazard. If you want to use a thick decoration that attaches to the door, you may need to give up use of your door for the holiday season. Any and all decorations must be able to withstand exposure to water and salt. Anything that dangles in front of your door from above may also limit access to the garage. 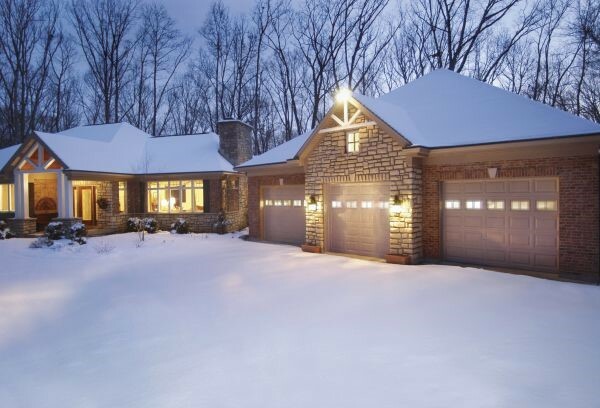 For more information about safely decorating your garage door in winter, contact your garage door repair people. At R & S Garage Door Service, we’re happy to answer client questions about garage door holiday decorations, maintenance, and other garage door related problems. Call today to find answers to any of your questions.